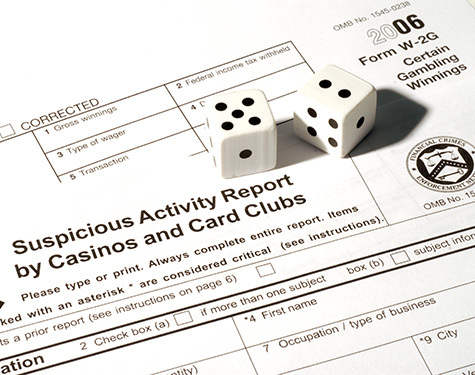 The TruCom product automates the IRS Title 31 and FinCEN reporting requirements for casinos. These organizations are focused on tracking tax reporting and compliance at a level not easily achieved by casinos, and they have recently started auditing at a much higher rate. Such audits include significant penalties and fines in excess of $50K. The majority of casinos in the U.S. currently use a manual reporting system as it has been done this way for many years. Auditors are increasingly focused on this process as there is much room for error and omission. Jackpot automatically reports W2G and 1042S forms for Title 31 compliance—because no one wants to mess with the IRS. A jackpot winner is caught up in the moment. Make it easier for him or her to complete the necessary paperwork. Process the jackpot directly with electronic W2G forms—or 1042S forms for non-U.S. citizens. If your casino averages hundreds of W2G forms a night, e-forms save your staff time and effort – and you the related costs. Any opportunity to take room for error and responsibility out of your cashier's hands is smart. Our redemption machines also make it possible to reduce or eliminate cashier staff, which is money to reinvest in your casino in the long run. Our system helps you stay Title 31 compliant and avoid regulation issues. Some companies don't offer the forms on paper, let alone electronically. Track total winnings and alert agents when a player wins over $400. The risk of employee theft is small because it's a closed loop.